I can get you there, I bet. Next up: let's drill down. 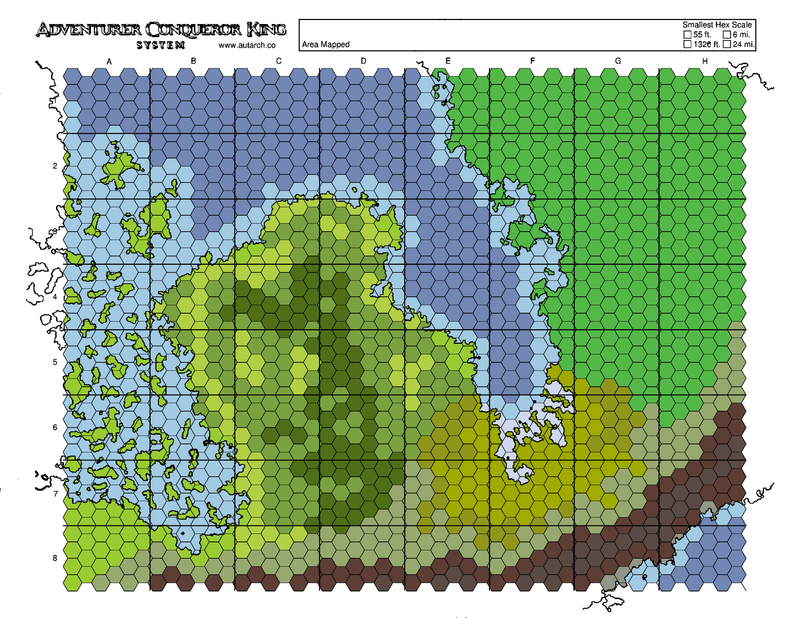 I took my previous map, made a copy of the ACKS hex and coastline layers, and combined them. I then paint-filled each hex with their terrain type. I'm not bothering with icons at this point. I ought to add a color key. 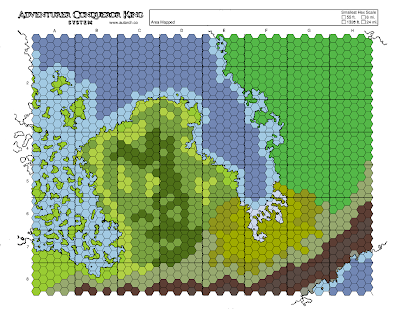 Having the coastline layer available helped a lot coloring the hexes. Looking at it, I forgot to add rivers viewable at this level, but, I'll be picking an area without them anyway. I make a selection in Gimp around D4-E5, then crop the image and immediately save it to another filename. Those four rectangular areas will fill Page 3 of the ACKS blank hex map. Next, I import Page 3, and do the same I did for Page 4 - add an alpha channel, select the white, delete it, invert the selection, paint it all black, resize to 2199x?. 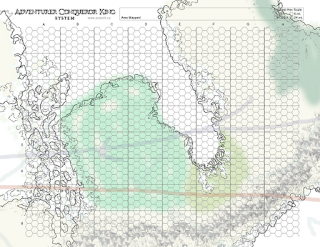 Now, if you're following what I did earlier, you're looking at a cropped map of around 476x367. We need to resize that to the scale of the ACKS Page 3. I copy Page 3, paste it as a new layer in my D4-E5 map, then I resize the canvas to the layers - so that the D4E5 image has the correct 2199x1699 size. Next, the annoying steps - we've got to resize the D4E5 map layer, coastline layer, and whatever other layer you want to keep to the same sizes. I resized my to 1950x?, and that seemed close enough. The only important bit is the coastline, and we're going to be altering it anyway. I turned down the opacity on the resized layers so I could better see the Page 3 hexes. I deleted the selection, leaving me with a "outline" of a too-thick coastline. I unselected, then erased one side of the outline - I would occasionally switch back and forth between the 'inner' and 'outer' line, depending on which way I wanted the more detailed coastline to go. Select by color, then paint-fill the line black. You may need to do it in sections if you broke up your coast switching between the inner and outer lines. Select by color, do one last fill. Then, shrink your selection until the line thickness is where you want it. I only had to do it once. This also gets rid of any floaters you've got around the sides of your line. Invert the selection, delete, select none. Check the line to make sure it's contiguous, it's also likely you'll have some thick spots to manually thin out. 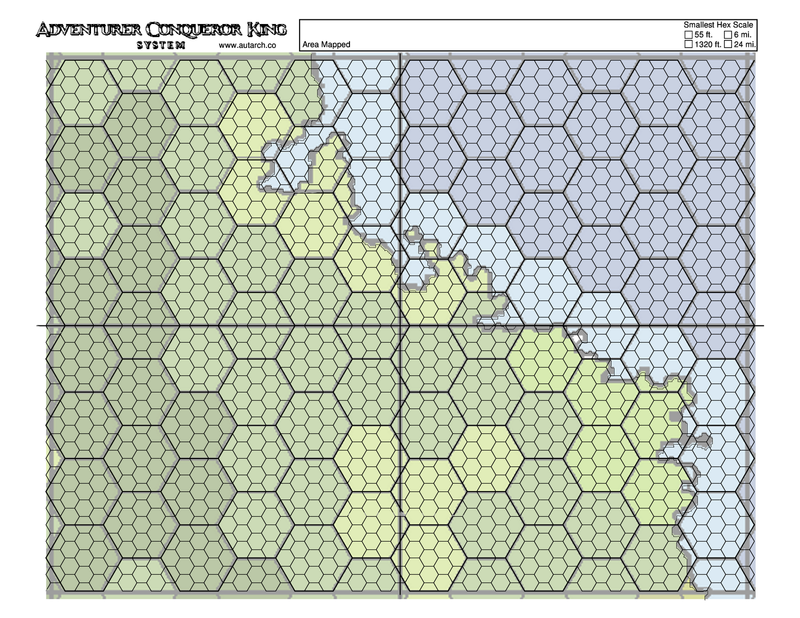 Now, as we did last time, make a copy of the coastline and Page 3 hex layers, and combine those copies. 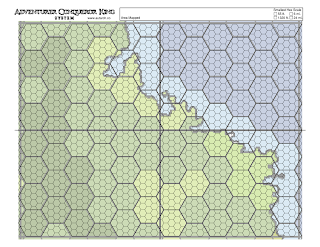 There's your fillable hexes for this layer. Have at it. Don't forget to break up the larger hex boundaries a bit. 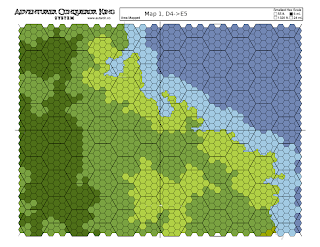 Let's finish this off with Page 2 of ACK's hex map PDF. The one thing you'll want to note here is you will need to separate the grid from the hex numbers - take a copy of the layer, erase all the numbers. Use that layer to do your hex coloring, then overlay the original layer with the numbers on top - ought to take less time to do that than to fill in every 6,9,0,etc. on the map. I did it a bit differently - after I erased the numbers, I took another copy of the hexgrid layer, and merged a copy of the numberless hex grid painted white on top of it to "erase" the grid, leaving the numbers. That allowed me to come back with a seperate number grid I could easily recolor, since the white numbers look a bit better against the colored hexes and black grid. 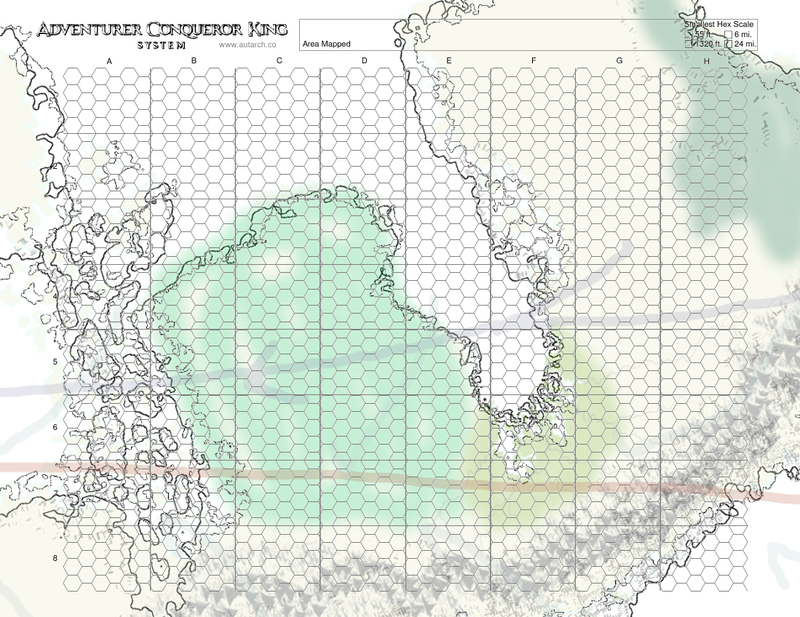 And here we are, the region I'm starting the players, taken from unmanageable continental bitmap to workable 6 mile hexes. I'd much rather this be in a vector format, but, hey. I may come back and do everything at the original 400 DPI depending on how it prints, but, as long as I keep everything I put on the map from here on out in layers by category, switching around should be easy. Plus, I can now whip out Page 1's like nobody's business, if I need a more exact view on a city location or a hex a PC will want to claim as her own - the smallest hexes on that map will be 1,320 ft. I'm the one you need to know. Of the list of annoying intelligent artifacts from children's shows, The Map from Dora ranks high. UPDATE: Read the bit at the bottom before you do anything like this. At any rate, I'm going to have to do some mapping if I want to get a sandbox game going. At the current point, I'm planning on running the excellent Adventurer Conqueror King system, from Autarch. PDF's $10, go get it - they've taken B/X and fleshed out the domain rulership/economic systems to something you don't have to think about too much. There's also a fleshed out domain warfare system coming, plus there's a complete class and spell creation system in beta. 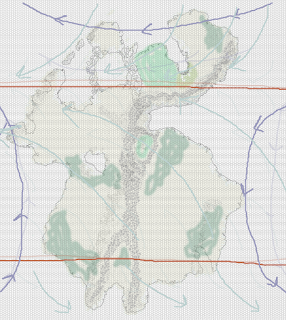 In this post, I'm using their freely downloadable mapping PDF with a continental map I made some time ago. The continent has been rotated quite a bit, after drawing the climate I had to revisit locations of some of my ecological decisions..
What you see there is a half-attempted icon map, which was about the third or fourth style of map I puttered around with following the many excellent tutorials at the Cartographer's Guild. It's an amalgam of two maps, one the icon map, the other a previous map I'd doodled some plant life assumptions on. I've overlaid a hex grid generated with the help of mkhexgrid, and drawn in the very basics of climate following Bat In The Attic's concise PDF here. The upper red line is my equator, the southern red line is the southern 30 degree latitude, the Tropic of Capricorn on Earth. Dark blue is ocean currents, light blue is air. I have no doubt I'm making incorrect assumptions about what the climate will actually be doing, but that's OK. It's magic. NOTE: I messed up at this point - I'd merged too many layers, and lost a good clean copy of my coastline. Don't do that! Scale wise, I've defined these hexes as 24 mile hexes, as is ACK's default, since I'm using their PDFs. The Googles tell me that each latitude line is about 69 miles apart - so between 0 and 30 degrees latitude is about 2,070 miles, or 86 24-mile hexes. I dislike the number 86 today, so I rounded that down to 80 (drawing my equator and tropic 80 hexes from each other), which means the distance from my equator to my southern tropic is 1,920 miles, making my latitude line distance 64 miles. If I take this to it's conclusion, 64*180 is 11,520, or 92% of the 12,400 value the Internet tells me is the Earth's distance from pole to pole. All else being equal, we're about 8% smaller than the Earth, which will never matter, but it's fun to know. Open the ACKs map PDF in Gimp, and import page 4, the long-range hex map. Paste it into a new layer on my map document. 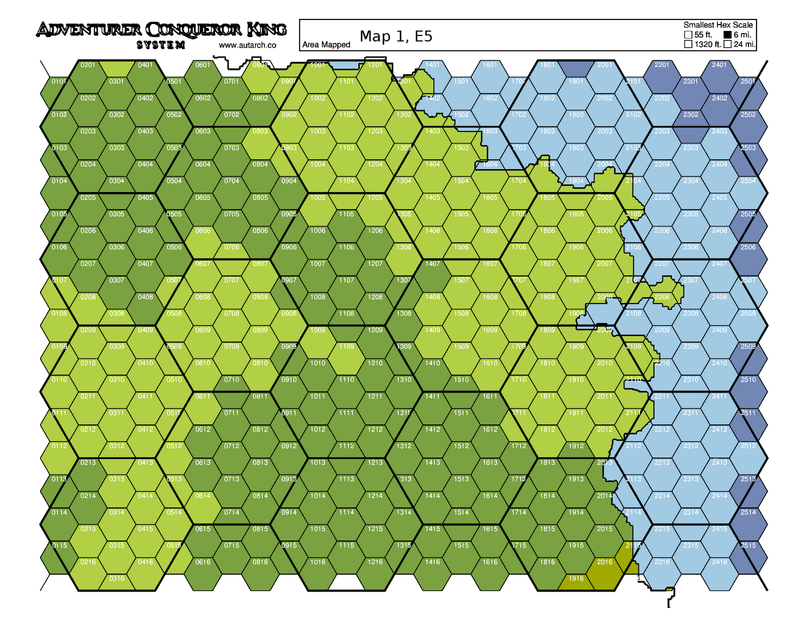 I resize the layer until those hexes more-or-less match my original hexes. Always resize with locked ratios! I label that layer "Map 1" - this Gimp file is going to be our master reference from now on, since as we expand, we'll continue to paste multiple copies of it into our master map to generate new pages of the world. I hide my original hex layer. I'll not be needing it except for reference of original intent. I center the layer about where I'm starting the PCs. I repaste my original, unresized PDF layer into this image. It should perfectly overlay the resized ACKS hex grid. Bit of a mess - I have two coastlines since I lost my original layer, then found the version of the coastline I preferred. Viola! 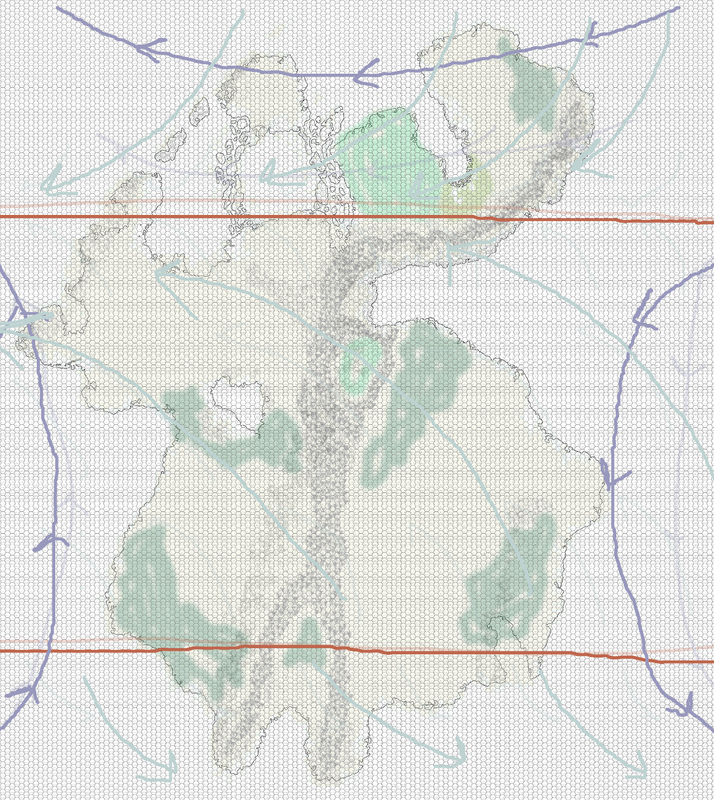 Here's Page 4 of the ACKS pdf with my map (in coastline, vegetation, and topographical layers) ready to work with. From here, I'd pick my artistic style and start drawing the area for real. In preparing the ACKS PDF page, I imported at 400dpi, giving me a 4399xsomething image. I added a transparency layer, selected all the white by color, deleted it, inverted the selection, painted it all black. I then converted the mode to indexed, with only 1 color (black). I wanted some extra resolution - I resized the ACKS PDF and my overlaid map to 2199xsomething, rather than the original 1099. This is my (most likely abortive) attempt at blogging my efforts to introduce the next generation of players (i.e., my children, and the children of a few friends) to the hobby. That hobby being the paper & pencil role playing game. After a bit of tussling around with Trailblazer, a well done modification of base 3.5, I fell into a few blogs, and after a while, settled on Adventurer Conqueror King, from Autarch. Not that Trailblazer wasn't excellent, and simplified 3.5 to some degree, but, after staring at a completed level 2 character sheet, I didn't see how I could pass it off to a 6 year old. "Going back to Basic", as it were, intrigued me, and ACKS has enough crunch in the domain management that I could probably not only develop the kids into kings and queens, but could lure the old band back together, maybe over Google+/Tabletop Forge.